Moses and the people of Israel tried everything else first before they got the courage to head for freedom. We find ourselves in the same position. But our freedom depends on us wanting to be free deeply enough that we trust God to meet us as we go. The strategy God chooses to use every single time he invites us to confront our bullies is whatever we have. Confrontation is key to freedom. You’ll be tempted to choose compromise over confrontation. Fear is the currency of oppression. If you participate in fear, you will either oppress or be oppressed. The only thing that will drive out fear is perfect love. You will only get up and go to freedom when you believe God will be with you. Coming to the end of ourselves is the first step to freedom—don’t be afraid. Are you in a situation where there is seemingly no good way out of the mess? Are you stuck? Are you working outside your ability to pull off goals and control situations? Name them. What do you fear? Name it. Get up and GO. Actually give an invitation. It’s amazing what pain can do—pain wakes us up to our slavery and can make us willing to unlearn the ways of Egypt (our slavery) and agree with God about who we are. But the grip of Egypt is not easily released. Freedom has to come from the inside first. The pain of slavery is deep within us all. But we have grown up learning to mask our symptoms. Pain is intended to wake up us to our situation and to God’s love. Pain is intended to be redemptive. Moses tried to bring freedom his own way, and he failed miserably. Before Moses could become the deliverer, he had to unlearn Egypt. It took a whole lot of pain, desert, and empty for him to unlearn the ways of slavery. Years passed, and the king of Egypt died. But the Israelites continued to groan under their burden of slavery. They cried out for help, and their cry rose up to God.God heard their groaning, and he remembered his covenant promise to Abraham, Isaac, and Jacob. He looked down on the people of Israel and knew it was time to act. 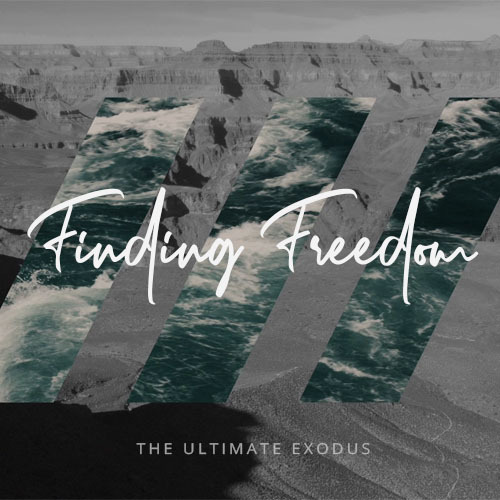 The God of Abraham invites us to empty ourselves, and learn the way of freedom. It’s amazing what pain can do—and it always get worse before it gets better. Identify areas of pain in your life where God might be trying to wake you up. Identify what you need to “unlearn” in order to leave slavery behind you? and a new experience of freedom. May it set me free. The Israelites forgot who they were and settled in, exchanging their values slowly but surely for the values of Egypt. For years they thought this was life, and didn’t realize they had become slaves. This is the story of our lives as well. We were created for freedom, but we will always return to slavery unless we remember and hold onto our identity. The story of the Exodus (“the going out”) is covered starting in Genesis 47 through the first five books of the Bible. Slavery is a tricky business. Many people who are trapped in its grip don’t even know it. We were created for freedom, but we will always return to slavery unless we remember and hold onto our identity. Freedom is a long-term, inside out work. Guard who you are in Christ. Consider your values over the past years. How have you seen values change around you? Have you slowly bought into something you should not have? Take a “Who I Am In Christ” card, and affirm it daily (or follow the link below). Let it shape your lifestyle. We were created for freedom, but we will always return to slavery unless we remember and hold on to our identity. White collar, blue collar, no collar. Executives, homemakers, retirees, and students. Having a great attitude toward our jobs applies to everyone—white collar, blue collar, no collar, executives, homemakers, retired, and students. If you’re willing to do anything - that’s not immoral or illegal - you’ll always have a job. Jobs don’t initially come looking for you. You have to go looking for them. Success requires submitting to authority, even if you have a bad boss. When no one will hire you, you can hire yourself. If you care about people, there will be something in every job that makes it worthwhile. WHO you are is more important than WHAT you do. Expecting appreciation from people will lead to frustration. Change the environment by changing your perspective. Doing what you do well brings honor to God.